So, how do you allow your child to take it easy, without spending an entire day watching the television? For me, the answer is crafts. I love the process of creation in a child. 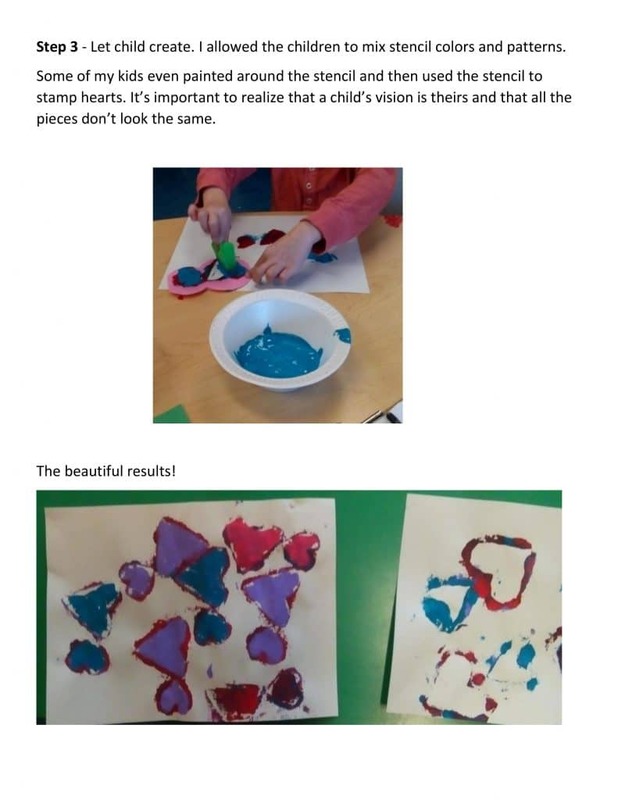 Arts and crafts help develop the entire child! Watching my son figure out how his muscles work with those fine motor skills is fascinating to me. Not only is my son expanding his creativity, he is also practicing math. He counts the number of stickers he used, he uses science when he experiments what happens when you mix certain mediums together. Now, you may be wondering, “Well, we are stuck at home. What kind of crafts can I do without running to the store for supplies?” The answer is simple, anything. Do you have breadcrumbs in your cabinet? How about oats? Why not use those bread crumbs and/or oats to allow your child to glue onto a picture? (This is also great for sensory play!) Those bread crumbs can allow for a great fish picture or anything else that your child may come up with. Do you have pasta? That pasta can be used to string onto string into a necklace or even onto a spaghetti noodle. Apples and peppers also make great stamps when they are cut in half. 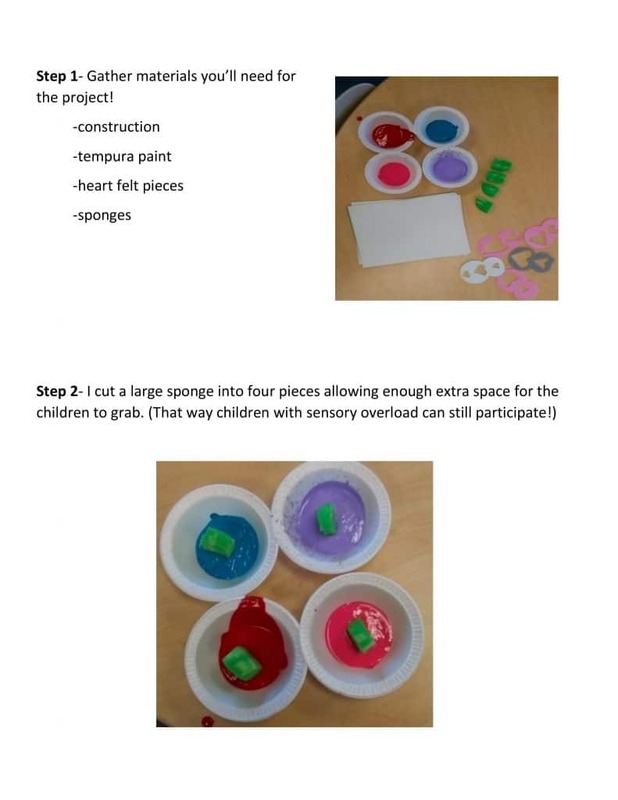 If you have sugar and salt, why not make some play-dough together? (There’s some science for your little one in there!) Boxes, water bottles, 2 liter bottles, bottle caps, aluminum foil, plastic wrap, shaving cream etc can all be repurposed to use for crafts. What about all of the possibilities outside? Why not turn those pesky pine needles into a paint brush or those leaves into a stamp? Have pinecones outside? Allow your child to explore their creativity and see what 3-D object that they can create using a pinecone. (Hey look, there’s some geometry for you). Painting rocks is another huge hit. (You could even let them know that they can hide their rocks for others to find once they’re feeling better). The possibilities are endless when you let your child’s imagination roam. Now it’s time to grab out that extra tissue paper! Allow your child to invent new ways to think about the world around them. Make sick days (or even break days) fun again and put down that remote. Here is a fun craft for Valentine’s Day! Want to have armloads of fun? 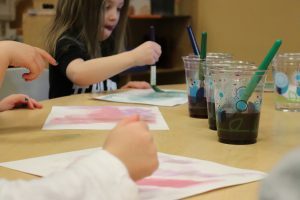 Incorporate finger paints and scents in one activity! Wow!! The Pre-Kindergarteners really loved this activity as they loved being able to get really involved in the set-up and of course the final pieces! Smells as good a it looks! The kids were learning about different habitats and Ms. Evelyn, the kids’ teacher, is native to the south. 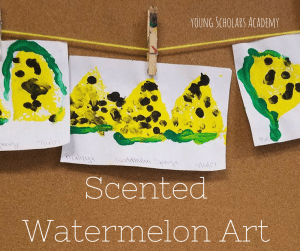 In the south, they have yellow watermelons which was a crazy concept to our 4 year olds, but in the end and through the giggles, really found this project fun! Extracts; our kids used fruit extracts like berries for example. This could also be a great opportunity for you to go through your cupboards! Mix a bit of the extracts into the paint and have the kids start their next masterpiece! One way to bring the lesson further is get a watermelon from the store and explore the different textures when tasting it. As something fun you could save the seeds and have the kids try and grow their own watermelons! Thank you for reading! If you’re trying this at home, take pictures and let us see! Painting with food–how fun is that??!! The Summer Camp class Safari had a lot going on with their curriculum, and this gem came out of the classroom last week! 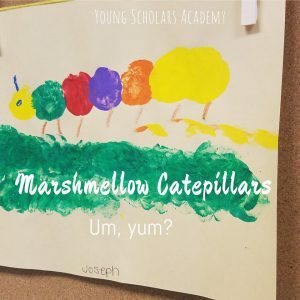 With their overall curriculum theme being “Insects” and a side lesson of the kids studying different textures and tastes, our amazing teachers went ahead and incorporated both! Here are the steps used; this would be a great activity for a camping trip, a night around the camp fire or if you’re just feeling crafty! Instead of using the paint brush as you would normally, have your kids put the marshmallows on the other end! Pour paint onto plates or bowls so the kids have access to multiple options. Now to allow creativity to happen we recommend you pull up a picture of a caterpillar or some other insect (if your child wants) and have them create it! They will make it look as they see fit, and that’s the beauty of it all!